It is the lot of everyone who walks the earth, at one time or another, to meet the dark angel face to face, and to suffer when sorrow and grief knock at the door. When that happens – when the dark shadow falls on our home, or on our community, we grasp for support from many places. One of the time-tested methods of mending hearts is through words. Finding the right words can act like a magic potion, speeding the long, slow process of restoration ever so slightly for those left behind. 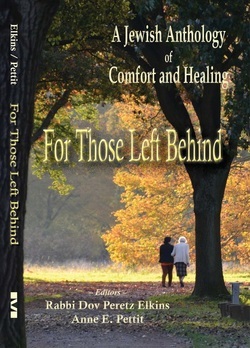 In this anthology of comfort and healing, Rabbi Dov Peretz Elkins and Anne E. Pettit present this collection, chiseled out of the crucible of the pain of many hands – some from years past, others more recent, some from cavernous voids, others from lesser degrees of sorrow. It is their hope that the soothing words they have included in this book can be a contributing source of healing that will uplift a sorrowing heart, dry a tearing eye, and send a mourner on the necessary path to normal living. More than 200 inspiring stories and commentaries included. Scroll down the page to see a preview.